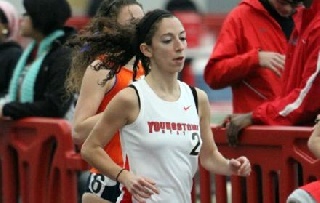 The Youngstown State track and field teams were in action on Friday at the WATTS one the first day of the YSU National Invitational. Highlighting the evening for the Penguins was a second-place finish by Anna Pompeo (17:47.79) in the 5,000m while Brittany Stockmaster placed sixth (18:21.34). For the men, Kodie Fennell placed fifth in the 500-meter dash with a time of 1:06.76. Jon Hutnyan places fifth in the 1,000-meter run with a time of 2:34.41. Dorian Davis finishes sixth in the long jump with a leap of 6.43m. Kyle Joynes places eighth in the 5,000-meter run with a time of 15:13.68. For the women, Megan Wesner places seventh in the weight throw with a distance of 14.78 meters. The women placed third in the Distance Medley Relay with a time of 12:26.10. Kendell Homan placed eighth in the pentathlon with 479 points. Team scores following the first day for the men have Bucknell in first with 106 points, Duquesne is second with 49, Detroit is third with 24, Robert Morris is fourth with 18 and YSU fifth with 15. For the women, Bucknell is first with 86.5 points, Dayton is second with 73, Duquesne third at 46, Ohio in fourth with 36 and YSU is fifth at 24. Action resumes on Saturday morning at 10 a.m. with the high jump, shot put and triple jump while the running events start at 11 a.m. with the sprint prelims.